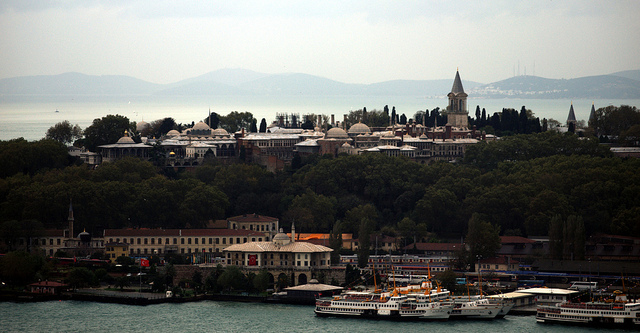 Situated on top of the most visible hill of Istanbul, Topkapı Palace is one of the symbols of the city. It was built in 1461 by the Ottoman sultan Mehmet II, who conquered Constantinople and made it Ottoman Empire’s capital in 1453. For more than four centuries the Topkapı Palace was administrative center of the Ottoman Empire as well as private house of the Ottoman imperial family. It was home to twenty two different Ottoman sultans and their families; as a consequence, the palatial complex expanded throughout its history with additional structures. 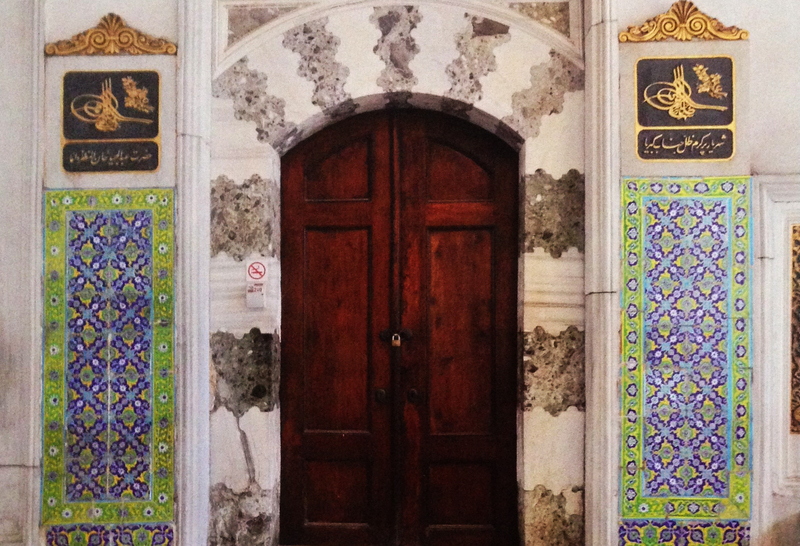 Since 1924, the Topkapı Palace is functioning as a museum and it is the most visited museum in Turkey. 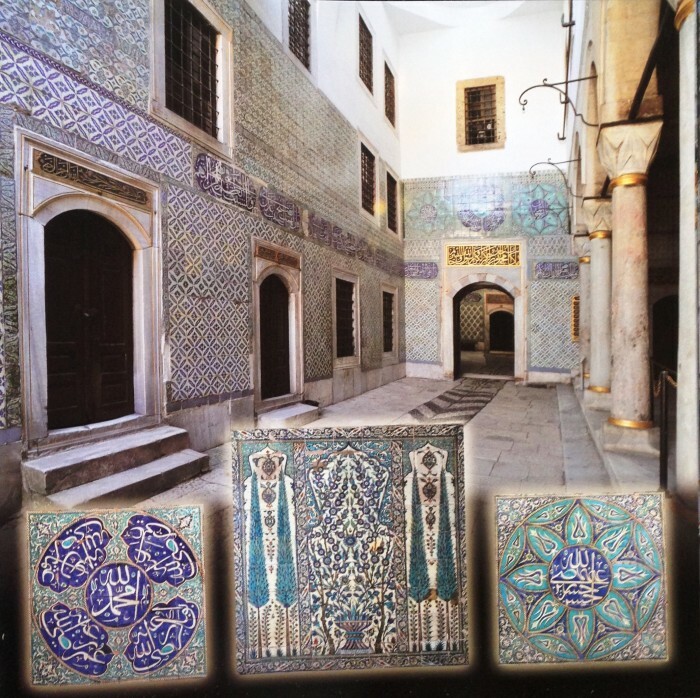 Although the palace expanded sultan by sultan and family by family, there was one decorative element that remained unchanged and everyone followed: Turkish mosaic tiles (çini) decorating the walls. 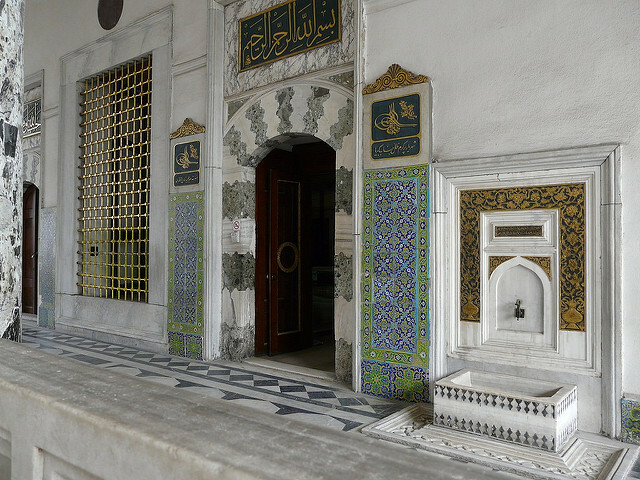 Our knowledge regarding the Turkish mosaic tiles of the Topkapı Palace is much less compared to its history and architecture, nevertheless this post attempts to give a background information regarding the Turkish mosaic tiles (çini) of the Topkapı Palace. Çini (Turkish mosaic tile) is a highly-decorated ceramic handcraft and its history goes back to the tenth century CE, Kara-Khanid-Khanate. Usage of çini became much more popular during the Suljuqs and Ottomans that were Turko-Islamic empires just like Kara-Khanid-Khanate. Compared to the Seljuqs, the Ottomans used Turkish mosaic tiles (çini) more and mosaic tiles in Topkapı Palace that was built in the mid-fifteenth century justify this. As stated, Topkapı Palace (Topkapı Sarayı) is a huge palatial complex consisting of hundreds of rooms/spaces and a great portion of them is decorated with Turkish mosaic tiles (çini). Situated on the northwest corner of the second courtyard of the Topkapı Palace, Imperial Council (Divan-ı Hümayun) was built in 1529 during the reign of Süleyman I (Süleyman the Magnificent). The Imperial Council (Divan-ı Hümayun) was one of the most important places in Topkapı Palace, because it was the cabinet room of the Ottoman Empire and essential decisions were taken here. The room contains Iznik mosaic tiles dating to sixteenth century and they are dominated by floral figures in blue, red, and green on a white background. 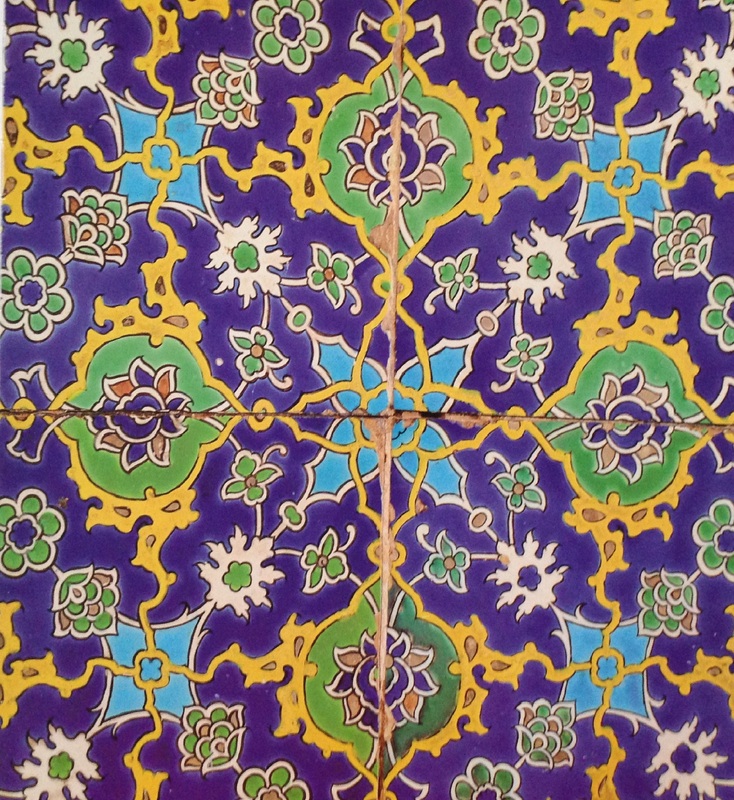 During the conservation/restoration in 2008, it was found out that the mosaic tiles in the Imperial Council was done with pen craft and underglaze technique. Underglaze technique is a tile decoration technique in which the figures are applied to the surface before it is glazed. In this way, glaze protects the figures and çini becomes more durable. Built during the reign of Mehmet II (Mehmet the Conqueror) in 1460s, the Chamber of Petitions (Arz Odası) is located in the third courtyard (enderun) of the Topkapı Palace. Its location is essential, because third courtyard (enderun) was private compartment of the Ottoman sultan and sultan himself had direct contact with the Chamber of Petitions (Arz Odası). For more than four centuries Ottoman sultans received foreign ambassadors and state officials in this room. 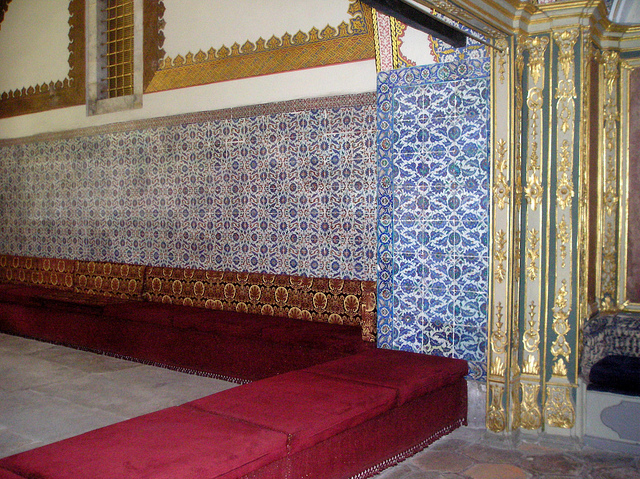 In addition, private topics between sultans and higher-ranking officials used to discuss in this room. As you can see in the photographs, mosaic tiles (çini) of this room are unique. There are two square-shaped tiles on the baseboard of the entrance door and they are Hatayi style mosaic tiles (çini) on navy blue background with thick-bordered floral figures. Their colors are unique as well, since its background color is navy blue and green is the dominant color on these two square-shaped tiles. On both sides of the door there are long mosaic tile panels on blue background with Rumi style mosaic tiles. These panels have borders with green background and very rich floral figures. Mosaic tiles of the Chamber of Petitions date back to late fifteenth century. Harem section of the Topkapı Palace was the private house of the Ottoman imperial family and black eunuchs were in charge of the administration of Harem. Their main task was to control exits and access to Harem and they were so important that in Ottoman protocol ranking they were placed third after Grand Vizier (equivalent of prime minister) and Şeyhülislam (Sunni Islam religious leader). The court of the black eunuchs was built during Süleyman II’s reign in 1560s; however, it was destroyed in 1665 fire and rebuilt in 1670s. The court of the black eunuchs is a complex containing several rooms and spaces such as a public space (sofa), courtyard, dormitory, and mosque. All these rooms are decorated with seventeenth-century Iznik mosaic tiles with underglaze technique. In terms of motifs rosette flowers, tulips, carnations, rumi calligraphy, and cupressus (cypress) are dominant in these mosaic tiles.